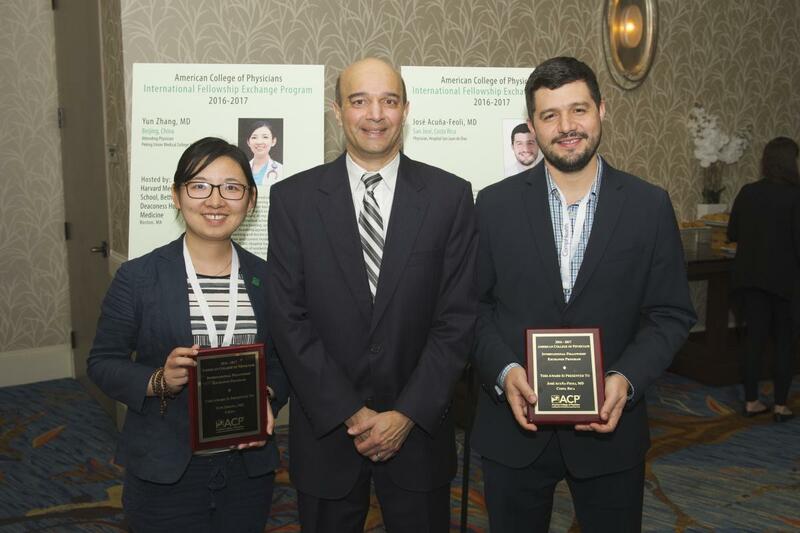 ACP’s 2016-2017 International Fellowship Exchange Program (IFEP) provided the opportunity to two early to mid-career physicians from outside the United States and Canada to gain expertise in a focused area relating to the prevention, diagnosis, and/or management of a clinical problem affecting Internal Medicine and the subspecialties. Through observation, mentorship, and study of work of senior faculty physicians, fellows were funded to acquire knowledge, experience, and skills that they can apply, utilize, and disseminate to colleagues upon return to their home country. Fellowships were observational and lasted approximately four weeks. Applications are now being accepted for the 2017-2018 program. Information can be found on ACP’s website at: https://www.acponline.org/IFEP. Awardees for 2016-2017 attended the ACP Internal Medicine Meeting 2017 in San Diego, California. They are pictured below receiving a plaque at the International Reception. From left: Yun Zhang, MD (China), ACP Immediate Past President Nitin S. Damle, MD, MS, FACP and José Acuña-Feoli, MD (Costa Rica).